Fort Campbell soldiers and families received Christmas trees in preparation for the holiday season. The annual Trees for Troops program was held Saturday morning near South Sports Complex Parking Lot near Air Assault St. and Wickham Ave.
More than 500 trees were donated to military families. "We've got tall ones, short ones, little tiny ones, we've got Charlie Brown type trees. 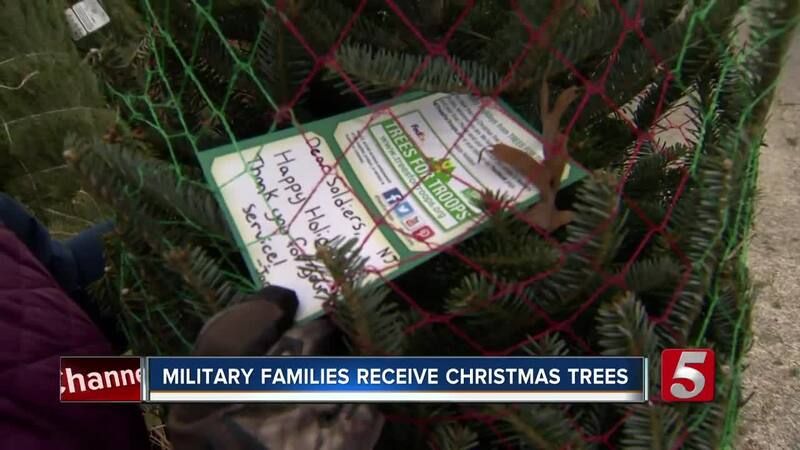 So we have a little bit of everything," said Heather Hinman who volunteered to pass trees to arrived military spouses. For Laura Celis, a mother of two, today is a tradition. She strapped her tree down on top of her vehicle with the help of her father. Her husband, who is stationed in Afghanistan, is expected to arrive in March. "This is our 3rd Christmas without my husband. So it's difficult, it's hard for our 6-year-old, our 1-year-old doesn't know him really," Celis said. She said she was happy to receive a tree this year despite running a little late. "People line up earlier, I'm telling you last year I lined up early. Today I was a little late but surprisingly I was able to get a tree. I think it's really fast, I remember last year we waited, I don't know, maybe like two hours," she said. Since the Trees for Troops program launched in 2005, FedEx has shipped more than 200,000 real trees to service members and their families-covering every branch of the military at more than 65 bases in 17 countries.